This is, of course, absolutely true. In the absence of facts, rumors are generated and persist far beyond any applicability to the situation which gave them life. Olree then continues, giving individual cases to illustrate his point. We examined each of the cases in an effort to decide whether or not his point is valid. “The Pennsylvania Crude Myth – This myth is based on a misapplication of truth. In 1859, the first commercially successful oil well was drilled in Titusville, Pennsylvania. It is human nature to be unsure about new technology. We agree that the situations vis-à-vis Pennsylvania crude oil and detergent oil is adequately explained by this aspect of human nature. The working fundamentals of many modern technologies, such as engine oils, are far beyond the grasp of an average person. When reading Bob Olree’s comments, we also acknowledge that they are applicable to an average vehicle and engine. There are few people who have as much direct experience with the issue of ZDDP (ZDP) and oil test Sequences as he has. However, to describe the current situation where oils are being marketed with little or no ZDDP as merely another “new or unknown = bad” myth does not do the facts of the situation justice. The older engines we are concerned about may have lifter foot pressures several times that of a low-performance engine such as those used in the Sequence III tests, and their wear characteristics are not predicted by common Sequence III testing methodology. One of our engineers drives a 1996 Chevrolet Impala SS with an LT1 engine which was filled at the factory with Mobil 1, and has never had any other oil in it. It has indeed broken in well, and at over 200,000 miles it still has very little blow-by. So, while we would tend to agree with Mr. Olree’s conclusion for the Impala SS specifically and for newer cars in general, we also know that the ring and engine block materials in engines of different ages and manufacture have very different break-in requirements. So, a statement such as Mr. Olree makes should not be thought of as a maxim that applies to all engines ever made. As a matter of fact, no engineer would use one data point to conclude this applies to all engines WITHOUT valid test results to back up the statement. If Mr. Olree does have the data (it would not be surprising given the amount of research he has been associated with) and was merely trying to keep the article short, we would like to review the material in its entirety. “The Starburst Oil Myth – The latest myth promoted by the antique and collector car press says that new Starburst/ API SM engine oils (called Starburst for the shape of the symbol on the container) are bad for older engines because the amount of anti-wear additive in them has been reduced. The anti-wear additive being discussed is zinc dithiophosphate (ZDP). 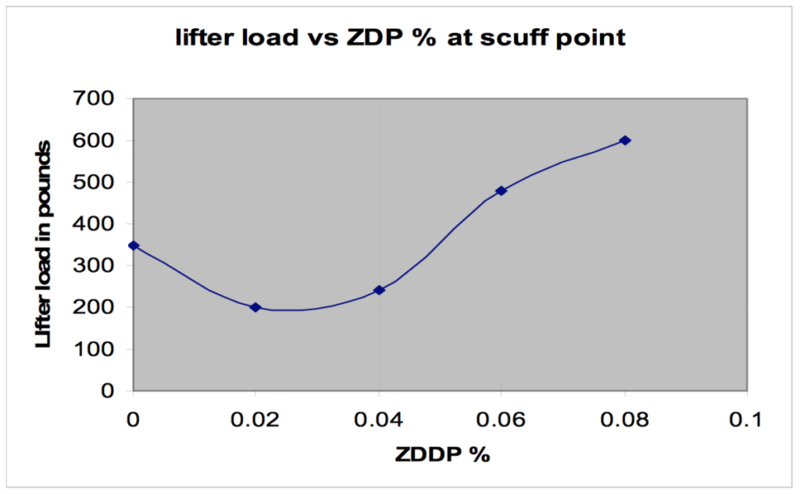 Before debunking this myth, we need to look at the history of ZDP usage. For over 60 years, ZDP has been used as an additive in engine oils to provide wear protection and oxidation stability. ZDP was first added to engine oil to control copper/lead bearing corrosion. Oils with a phosphorus level in the 0.03% range passed a corrosion test introduced in 1942. In the mid-1950s, when the use of high-lift camshafts increased the potential for scuffing and wear, the phosphorus level contributed by ZDP was increased to the 0.08% range. In addition, the industry developed a battery of oil tests (called Sequences), two of which were valve-train scuffing and wear tests. A higher level of ZDP was good for flat-tappet valve-train scuffing and wear, but it turned out that more was not better. Although break-in scuffing was reduced by using more phosphorus, longer-term wear increased when phosphorus rose above 0.14%. And, at about 0.20% phosphorus, the ZDP started attacking the grain boundaries in the iron, resulting in camshaft spalling. By the 1970s, increased antioxidancy was needed to protect the oil in high-load engines, which otherwise could thicken to a point where the engine could no longer pump it. Because ZDP was an inexpensive and effective antioxidant, it was used to place the phosphorus level in the 0.10% range. However, phosphorus is a poison for exhaust catalysts. So, ZDP levels have been reduced over the last 10-15 years. It’s now down to a maximum of 0.08% for Starburst oils. This was supported by the introduction of modern ashless antioxidants that contain no phosphorus. Enough history. Let’s get back to the myth that Starburst oils are no good for older engines. The argument put forth is that while these oils work perfectly well in modern, gasoline engines equipped with roller camshafts, they will cause catastrophic wear in older engines equipped with flat-tappet camshafts. We have never been able to find the results of these tests on older engines. We would need to study those reports to see exactly which engine types and cam and cam follower types were involved. The fact is all test Sequences we have studied use non-performance engines with low spring-pressures, indeed in the Sequence IIIG test, the static lifter load is 350 pounds.2 Many high-performance engines have as much as 500 pounds or more of lifter foot pressure. Referring to the Bennet data, this would indicate that, in order to keep from scuffing, a ZDDP level of .065% minimum would need to be ensured. “The new Starburst specification contains two valve-train wear tests. All Starburst oil formulations must pass these two tests. We wish that it were true that all modern oils contained 0.08% phosphorus from ZDDP. Our recent tests of two major name brand oils bearing the SM grade contain <0.06% phosphorus, therefore cannot contain even that much ZDDP . We know there are technologies other than ZDDP which can function as effective EP anti-wear agents for some engine designs, as proven with newer engines with roller cam followers. The most recent SM formulations in particular have shown a move to boron-based EP additives, with a concurrent further lowering in some oils to <0.06% phosphorus. We have been testing virgin oils on an ongoing basis, and most quality oils in early 2007 have had a phosphorus level in the 0.05% to 0.08% range. We recently tested two new oils: Mobil 1 Extended Performance SM 10W-30 and Valvoline Premium SM 10W-30 oil. We had the oils tested for both zinc and phosphorus following the ASTM AA and D-4951 methods respectively. The results showed <0.06% phosphorus in either oil. While this is good news for the owners of new cars with catalytic converters, it does mean that in order to retain the SM certification they both claim, there has to be an EP additive different than ZDDP incorporated into both formulas. “Despite the pains taken in developing special flat-tappet camshaft wear tests that these new oils must pass and the fact that the ZDP level of these new oils is comparable to the level found necessary to protect flat-tappet camshafts in the past, there will still be those who want to believe the myth that new oils will wear out older engines. Our study of the ASTM test Sequences IIIE, IIIF, IIIG, IVA and VE required to achieve certification reveal that NONE were developed using high-performance engines. Indeed, these tests were developed using relatively low- performance engines intended to model average current and emerging vehicle engine wear characteristics. This makes absolute sense considering the purpose of the oil specifications is to provide a standard set of performance criteria for oil to be used in new over-the-road automobiles and trucks. The standards are not intended to infer any degree of backwards compatibility with older or specialty engines. In one statement Olree, while investigating the amount of ZDDP needed to protect engines, stated: “Arguing that modern oils should pass tests developed 25 years ago to protect engines built 30 years ago is a rather useless exercise.”3 Since he is studying the situation from the perspective of designing the lubrication for the next generation of motors, we see his perspective for making such a statement. In doing so, he is acknowledging that the test is not specifically designed to quantify an oil’s performance with older engines. Unfortunately, “those” engines are the ones we enthusiasts run and care about. It is our belief that there is no overt movement in the oil industry to create new oils that are bad for older engines as some conspiracy theorists may speculate. There certainly IS a movement in the oil industry to create new oils which are tailored to the specifications and requirements primarily of newer cars, and secondarily of older vehicles. This does not mean they are concerned at all with 30-year-old muscle cars. To the automotive industry an OLD car is 10 years old. The cars we care about are invisible to the OEM industry. While we have great faith in the engineering behind the new oils, we also notice that backwards compatibility with 100% of old engines is not on the product spec sheet. The oil manufacturers obviously know of the importance of ZDDP to older flat-tappet engines, as many of them are steering owners of these engines toward their ZDDP-formulated diesel oil line, showing they acknowledge the need for ZDDP in these engines. Unfortunately, the characteristics and available viscosity ranges of diesel oil may not be suitable for our engines. As Bob Olree knows better than we do, the amount of investment and research required to define, specify and perfect a set of tests and resulting standards is huge, and off-the-cuff recommendations like one sees in advertisements for oil supplements, are poorly thought out and ill-advised. Our position on the right oil and additive package to use is simple: an individual should be using the oil specified at the time of manufacture of the specific vehicle. Period. An engine is a fantastically complex and well thought-out machine, and we believe almost all oil additives are simply get rich schemes, impose unnecessary cost, and are unneeded at best, dangerous at worst. Our conclusion and current recommendation is to augment one of the new and superior base stock modern oils of the correct viscosity with additional ZDDP in order to bring the oil’s EP characteristics to that for which the engine was designed. We know from years of oil testing, ZDDP is compatible with all base stocks and other additive packages, including the newer Boron EP additives. So, there is no risk in adding it to achieve 0.12% phosphorus, a level similar to that formulated into SF or SG oils. 1 P.A. Bennett, “A look at the Effects of Lubricant Additives on Surfaces,” SAE pub. 580111, (January 1958), 6. 2 Robert M. Olree and Michael L. McMillan, “How Much ZDP is Enough?,” SAE pub 2004-01-2986, (2004), 9. 3 Robert M. Olree and Michael L. McMillan, “How Much ZDP is Enough?,” SAE pub 2004-01-2986, (2004), 11.